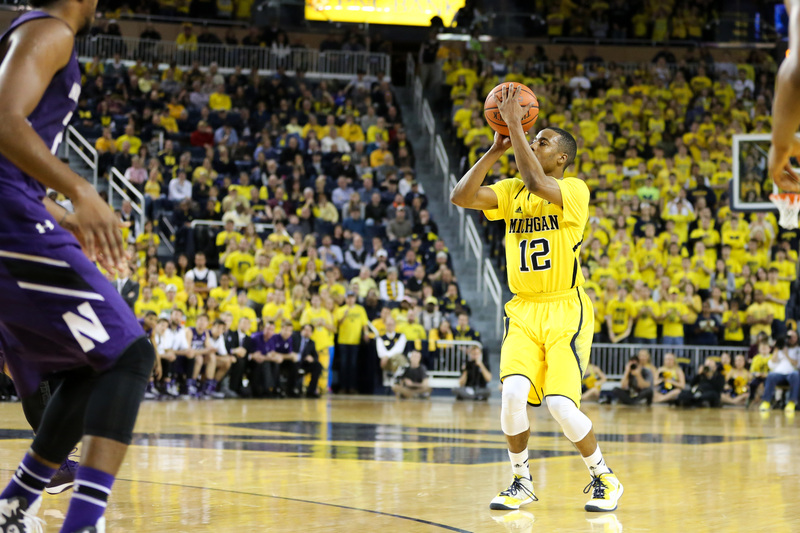 Muhammad-Ali Abdur-Rahkman played just 51 minutes in Michigan’s first 16 games. Suddenly, he’s been forced into a starting roll and has emerged as one of Michigan’s go-to options on the offensive end. Here’s a closer look at the 6-foot-4 freshman’s recent impressive play and what he’s done so well. Muhammad-Ali Abdur-Rahkman played just 51 minutes in Michigan’s first 16 games. He sat and watched Michigan’s loss to NJIT from the bench. He didn’t record his first career field goal until the next game in a loss to Eastern Michigan. The 6-foot-4 guard played double-digit minutes just once over the first 16 games of the season (a 0 point, 0 of 4 shooting, 1 turnover, 2 foul showing against Nicholls State) and never looked like a major threat to contribute. Suddenly, he’s been forced into a starting role due to injuries to Caris LeVert and Derrick Walton and he’s emerged as one of Michigan’s go-to options on the offensive end. Production was never an issue for Abdur-Rahkman in high school. He scored a whopping 2,136 career points during his four years at Allentown Central Catholic, but still was being recruited primarily by lower-level Division I schools. A fateful call from Dave Rooney to John Beilein resulted in Abdur-Rahkman ending up in Ann Arbor, but no one expected this sort of ability, this soon, from the freshman guard. The transformation has happened almost overnight. Abdur-Rahkman is averaging 8.7 points per game over Michigan’s last six games and set a career-high with 18 points in his first game at the Breslin Center on Sunday. Perhaps the most impressive element of Abdur-Rahkman’s game is that he is one of the only Wolverines who can score consistently inside the arc. Michigan is shooting 43.6% on twos in Big Ten games, only 11th best in the conference. Derrick Walton was shooting just 17% on twos in Big Ten games before sitting out the last two and Zak Irvin isn’t much better at 35.2%. Along with Aubrey Dawkins (61%), Ricky Doyle (58%) and Max Bielfeldt (55%), Abdur-Rahkman (61%) is one of just four players on the roster to make more than half of their twos in league play. Considering the degree of difficulty and how many of his shot attempts he has to create for himself, rather than catching and finishing around the rim, that’s a very impressive statistic. 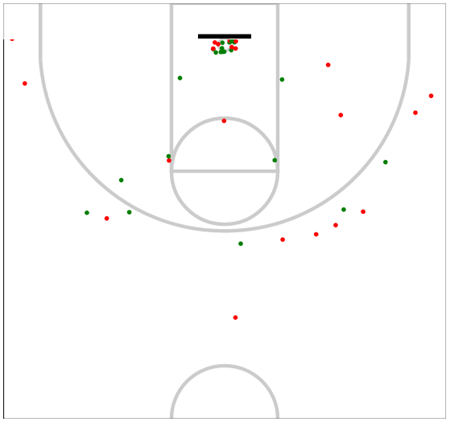 Here’s Abdur-Rahkman’s shot chart over the last six games, via Shot Analytics. 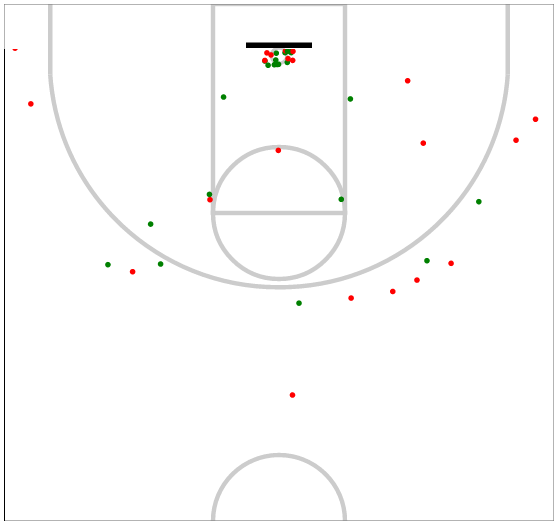 You can see there’s a decent spread to Abdur-Rahkman’s shots and effectiveness. He’s shooting an impressive 63% at the rim, where most of his attempts occur, as well as 56% in the midrange and 33% three during the last six games. Where have his points been coming in the flow of Michigan’s offense? We broke down some of the film to focus on some of his strengths and weaknesses going forward. Abdur-Rahkman’s primary ability is to take his man off the dribble in an isolation set. This was about all that we saw from Abdur-Rahkman at the prep level, so it’s no surprise that he’s most comfortable in this element. I think back to a Beilein quote from last year after matchup with Penn State. Beilein was talking about DJ Newbill schooling Nik Stauskas, and it’s not fair to compare Abdur-Rahkman to Newbill just yet. And I’m sure any Philadelphia native will tell you that Allentown isn’t really Philly, but Abdur-Rahkman has all of the makings of a classic ‘Philly guard’. Abdur-Rahkman has the ability to just take guys off the dribble and score points. He’s not going to be able to do it every night and against every defender, but just watch the first clip above. There aren’t many guards that can go isolation one-on-one against Branden Dawson and score right through him. These aren’t easy baskets. Many of them are challenging shots late in the shot clock against tough competition. Abdur-Rahkman’s poise to settle and finish around the basket and around defenders continues to impress. Michigan’s offense was electric in transition last year with a bevy of three-point threats and Glenn Robinson III’s athleticism to finish at the rim. This year’s team has lacked the aggression, athletic ability and mentality to get out and excel in transition. Given the recent injuries, that transition game has become even more defunct. Abdur-Rahkman is one exception to that rule. He has the requisite speed and he’s been able to find a few easy extra baskets for an otherwise struggling Michigan offense. Michigan’s regression in the ball screen game is something we’ve covered quite a bit this season. Caris LeVert struggled to stick the mid-range shots required to make the ball screen game effective and Derrick Walton failed to find his niche. The Wolverines are left with Zak Irvin and Spike Albrecht to be their primary ball screen creators and while Irvin lacks the ballhandling and passing ability to be a great pick and roll player, Albrecht lacks the size and athleticism to take the ball to the hole and finish. It sounds crazy, but the guy who was sitting at the end of the bench all season is suddenly Michigan’s best option for a late pick and roll set. Michigan isn’t going to dial up 10 to 15 ball screens for Abdur-Rahkman per game – yet, but he’s showing a lot of promise in this area of the game. Where he needs to improve is on his distribution out of ball screen sets, you can see one assist in this clip, but as defenses adjust and improve we’ll need to see increased vision from Abdur-Rahkman. If you can’t hit a jumper off the dribble in the ball screen game, opposing defenses can cheat and eliminate every other option. Abdur-Rahkman has hit just enough off the dribble jumpers to keep defenses honest. Abdur-Rahkman isn’t a knock down shooter yet, but he’s made 6 of 17 threes in Big Ten games and that’s good enough for a primary dribble drive threat. His 35.3% three-point shooting percentage in Big Ten play is better than Caris LeVert, Zak Irvin, Max Bielfeldt, Kameron Chatman, Mark Donnal and Spike Albrecht. Only Aubrey Dawkins (50%) and Derrick Walton (38%) have him beat. Muhammad-Ali Abdur-Rahkman’s breakout performances have been so critical because he fills so many of the niches that Michigan’s injured stars vacated. With Caris LeVert sidelined, Abdur-Rahkman provides a legitimate dribble drive threat for a Wolverine offense that was sorely lacking. Without Walton, Abdur-Rahkman has stepped in to provide some perimeter defense, ball handling and has even shown some lead guard abilities. The sample size is still incredibly small and it’s impossible to overstate the effect that a couple big games can have on your opponents’ preparations. If Michigan played Iowa last week, Abdur-Rahkman would probably be near the bottom half of the scouting report, but on Thursday he’ll probably be at the top. Similar to Aubrey Dawkins, who went 0 of 2 from the floor after his 20 point explosion against Illinois, there will be some regression toward the mean and an adjustment period sooner than later for the 6-foot-4 guard. But it’s clear that 16 games into the season, Michigan stumbled upon a quality player. His role will adapt and change going forward, but the Wolverines appear to have finally figured out how to utilize him appropriately within the offense.